The interesting thing about our relationship is that after that first “he picked the other girl” hooplah, I only remember Josh as part of my life. I don’t remember a lot about how our relationship progressed. We were sixteen – still so, so young, still learning so, so many things. Sometimes I wonder if our attending different schools in those early days is what wove us together so tightly. We never grew weary of each other because we weren’t together all day. We wrote one another notes at least every day, which we would deliver at church on Wednesday nights.We talked on the phone nearly every night. It was simple and pure, really – we just dove head long in knowing each other – not because we knew to intentionally do that in a budding relationship – but because we liked talking to each other. I was a big Josh fan, and he was a big Emily fan. 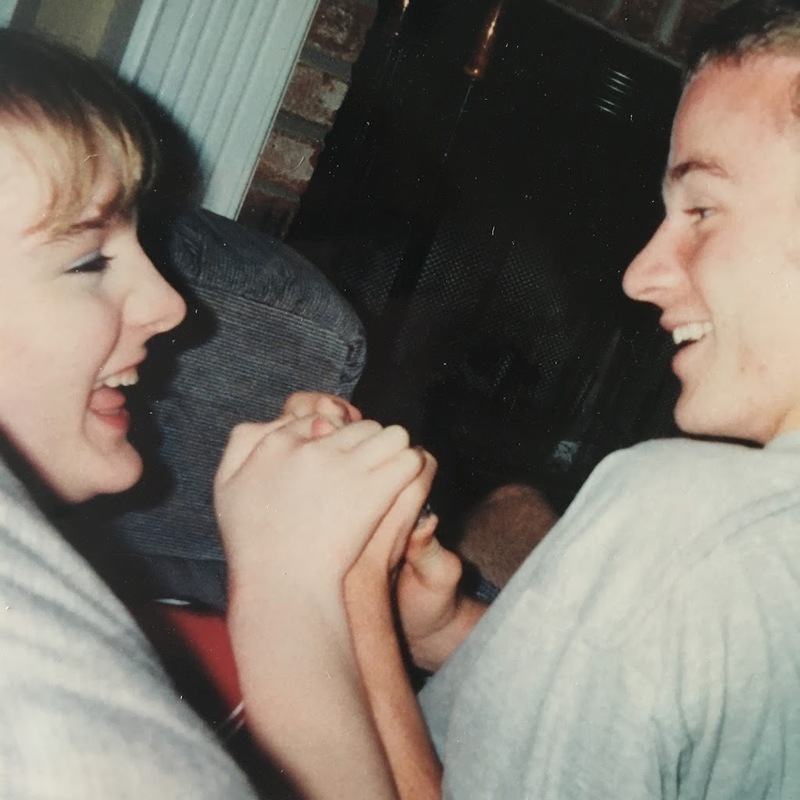 This, I think, is the beauty of high school sweethearts. We grew up together and learned one another as we went. We didn’t try to analyze where the relationship was going or what the future held. We liked each other, and that’s all there was to it. A few weeks after we began officially dating, we took a weekend trip out to Toledo Bend to stay at our friend, Leigh’s, lake house. It was an annual thing, and it was the most fun. The girls slept upstairs in the loft area while the boys slept downstairs on the living room floor. Yes, we all actually slept in our assigned spots. We spent our days walking the beach, throwing the frisbee, playing board games, laughing until we cried, eating all the food, and napping as much as we wanted. We spent our evenings eating more and sitting around a campfire. We talked and laughed and laid a lifetime foundation, without even realizing what we were doing, for what friendship should look like. On this particular trip, while the boys were sitting around the campfire and the girls were snacking in the kitchen (let it be said that teenage girls eat every bit as much as boys! ), Josh and I stole away to the dock. I’d been waiting as patiently as possible for that first kiss. Have I mentioned that I was really into Josh? And also that I really liked boys in general? And, for the love of the land, I really wanted this particular boy to lay one on me? This was a foreshadowing, just like everything else, of the way I run ahead like a crazed maniac shouting wildly, “Hurry up! Let’s get on with it already! Patience is for the birds!” To this day, I leap without looking and lay dead down on the rocks below while Josh is still analyzing the path behind me, taking his time, cautiously observing each step. We are in a constant pull against one another, and while this can be infuriating for both of us, it also saves us both from either never experiencing anything or…lying dead on the rocks. We stood on the dock, looking out over Toledo Bend, the moon blanketing us in vague, shimmering light and the cool Louisiana fall air casting a vague dampness over our skin and hair, making us shiver and shove our hands in our pockets. (Yes, it is exactly that romantic in my sixteen-year-old memories…whether it was ACTUALLY that romantic is pretty much irrelevant.) We talked and talked – standing looking out over the water, sitting criss cross applesauce on the ground, lying side by side on our backs – good grief alive will this boy ever kiss me? – and then silence. He reached over, turned my head toward his, and kissed me…short, simple, sweet. All the butterflies, y’all. All of ’em flying all over the place. I could’ve stayed there all night until, approximately 2 seconds after we kissed, Josh, “Okay! You ready to go back?” That was that. Homeboy had done what he set out to do. He walked back to the fire to tout his victory to his friends so that they could acknowledge it shortly and move on to more important topics like sports stats or the latest guitar chord they’d learned. I, however, walked inside to be greeted by gushing and cheering all around! From that night on, Josh and Emily just kept being Josh and Emily – but with kissing. In the spring of that school year, I came down with what we affectionately refer to as, “the mono”. The case was so serious that I found myself in the hospital for a night and out of school for nearly a semester. I’m not kidding. I would get so tired that I would fall asleep at 8 o’clock at night, sleep through the night, and not wake up until 10 the next morning. It was during this fiasco that Josh became more than just a boy that I really liked and really, really liked kissing. He would come to my house as often as my parents would allow (What do you MEAN he can’t come over EVERY night? Can’t you see that we’re in LOVE? !…bless my heart) and sit with me. I would throw a pillow over on him and sleep on his lap while he watched TV. This often meant that he missed out on spending time with our other friends, and I began to see how self-sacrificing he was – how tender-hearted and compassionate he was, how much he really cared about me. Those few months of focused, isolated together-ness might’ve seemed unhealthy to some – I’m pretty sure to my parents without a doubt – and I imagine in some ways they were, but they also transformed Josh into my very best friend and, I think, me into his. We were able to be ourselves with one another – to let our freak flags fly high – without fear of rejection or judgement. We laughed hard and often. We watched movies and ate dinners and (I’m slightly embarrassed to admit) fell asleep on the phone with one another. So today, go ahead and do it: mentally list your grievances with your spouse. We all have them…and if you’ve been in it for long, grievances may not be a strong enough word. Then, after you’ve listed all that out, stop and consider what you DO like about your spouse. If you’re going to take the time to list the rotten, it’s only fair to take inventory of the redeeming, too. Next week come back for the break-ups. All the break-ups, y’all! And coming up on Thursday is another book review. Get you some sun and some rest and some happy this week! 😂😂😂High school romance never disappoints!! !